A young receptionist witnesses a assault taking place in one of the rooms of the hotel she is working for. 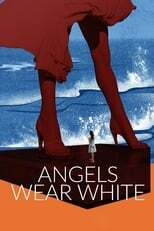 Angels Wear White is directed by Vivian Qu and was released on May 4th, 2018. Director Vivian Qu's Drama movie Angels Wear White is produced by 22 Hours Films & Hangzhou Puhua Chuansheng Cultural Investment Partner & was released 2017-12-24.